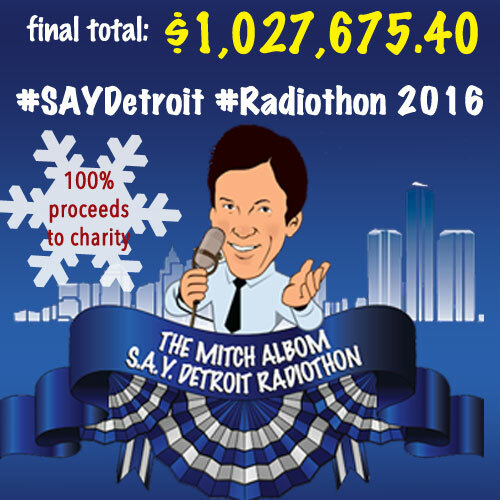 For the second year in a row, the annual S.A.Y. Detroit Radiothon raised more than $1 million during it’s fifteen-hour broadcast from the Somerset Collection in Troy, MI on Thursday, December 8. The day featured interviews with old and new friends, including Hugh Jackman Dr. Phil, Lily Tomlin, Tim Allen, Jane Pauley, Billy Bob Thornton, Paul Stanley, Alice Cooper, Dax Shepard, Jeff Daniels, Dan Gilbert, Andre Drummond, Detroit Lion’s QB Matthew Stafford, Red Wings’ captain Henrik Zetterberg, Mayor Mike Duggan. Joining in as cohosts throughout the day were bestselling author Dave Barry and jazz great John Pizzarelli, who crafted many personalized jingles for callers. 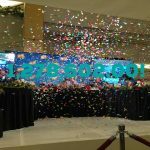 Though the final announced tote board put donations at $1,027,675.40, donations have continued to pour in, raising the current total above $1,045,000. Funds were raised by donations from callers and sponsors, as well as auctions of one-of-a-kind experiences, such as a trip to Los Angeles to meet Dr. Phil and attend a taping of his show as a VIP, brunch with Jane Pauley in NYC, private airplane rides over Detroit and to East Lansing or Ann Arbor, professional video taping of some time on the field with Matthew Stafford or on the ice with Hank Zetterberg go a jacket worn by Sawyer Fredericks of The Voice, which brought in the highest bid at $7,000. 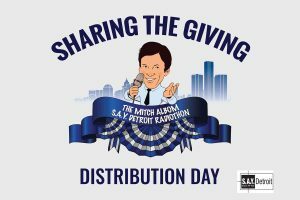 The donation form, as well as remaining incentive items like signed memorabilia, remain available at www.mitchalbomradiothon.com through the weekend. For the first time this year, the live stream was available on Mitch Albom’s Facebook page through Facebook Live, reaching audiences as far as Hong Kong and Gold Coast, Australia. While the day brought must-listen entertainment on stage and over the line, the true joy shared comes from the testimonials shared by those who have been helped by the charities benefitting from the radiothon: Adam Transki, an Iraq war vet and former Marine, battled back addiction and homelessness with the help of the Michigan Veterans Foundation, and is now a senior in college; Zana, formerly homeless, is working her way through Vista Maria’s transitional housing to pursue a high school diploma and hopes to attend college to study dance; D’mitri Moore, a Detroit Dream Scholarship recipient graduated from the College for Creative Studies and now works in the creative department for MARS in Detroit, while his classic Steve McQueen poster won the Grand Prix poster competition; Briana Bicy was formerly homeless. She was squatting in an abandoned house when police found her (and her children). With her mentor at COTS and with the help of Bright Beginnings Day Care, she now works with “Rebel Nell’’ Jewelry, which hires underemployed and impoverished women to make jewelry; Sisters Unika and India, and their friend Daejanique, who have become mentors to younger students after finding solace in Erica Wright’s grassroots Westside Cultural & Athletic Club, which fills the void of parents who are involved in drugs or other negative behaviors; the moving story of Fr. Tim of the Pope Francis Center, who found Rosey White homeless and crying on his church steps and through the church found a job, a home, and then started her own literacy program for the poor and homeless; a woman who found a critical and life-saving diagnosis through the S.A.Y. Detroit Family Health Clinic; and the story of a retired naval officer and his student mentee at the S.A.Y. Detroit Play Center. 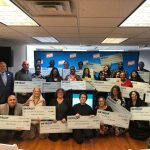 As has become tradition, three families were given the keys to their homes through the Working Homes/Working Families program, which pairs refurbished homes with working families, in need of decent housing, who can maintain them. Mia and her family of 9 children became homeless after a fire destroyed her home in March 2015. She lost everything but her family. She currently lives with her kids in the home of a church member. As of today, Mia will move into her new house on Dec. 21 (fingers crossed! ), right before the holidays. Lillie and her 3 girls children hopefully will be able to move in before Christmas (Dec. 23). Lillie is currently being housed by the Detroit Rescue Mission Ministries. Lillie has had a tough life. Her mother was murdered when she was 1, and her grandmother died a couple of weeks later. She was in the foster care system for a while and eventually became homeless, sleeping in a car. Retired army sergeant Leo Cooke and his family were moved into their new home the following day.